With a focus on theory, Suranovic presents economic models to demonstrate how economists understand the world. 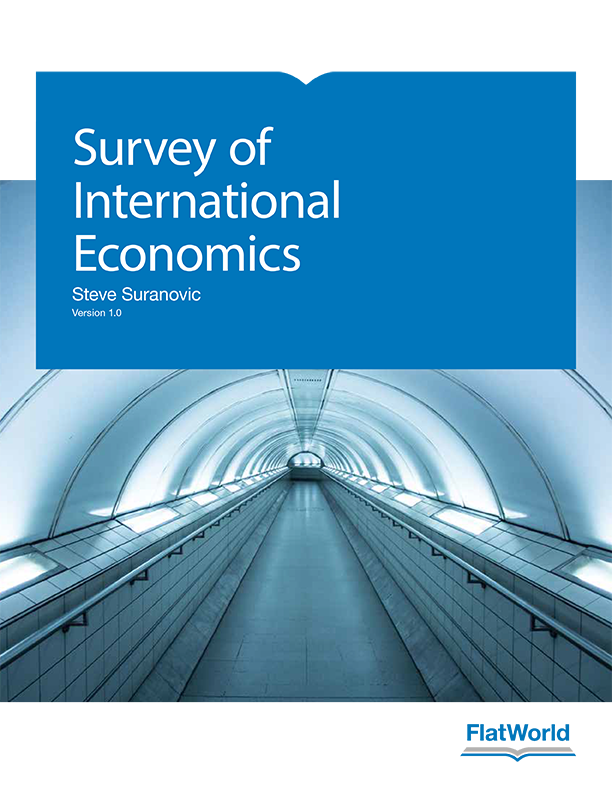 With detailed descriptions, rather than advanced mathematics, Survey of International Economics illustrates how a model’s assumptions influence its conclusion. This text is geared to students who are interested in advancing to a Ph.D. program or for non-economic major students. 11.5 Which Is Better: Fixed Or Floating Exchange Rates? Steve Suranovic is an associate professor of economics and international affairs at the George Washington University (GW) in Washington, D.C. He has been teaching international trade and finance for more than twenty five years at GW and as an adjunct for Cornell University’s Washington, D.C, program. He has a PhD in economics from Cornell University and a B.S. in mathematics from the University of Illinois at Urbana-Champaign. He has been a Fulbright Lecturer at Sichuan University in Chengdu, China, and has taught a GW class at Fudan University in Shanghai every summer since 2009. He has also spoken to business, government, and academic audiences in Japan, Malaysia, the Philippines, China, and Mongolia as part of the U.S. State Department speaker’s programs. His research focuses on two areas: international trade policy and behavioral economics. With respect to behavior, he examines why people choose to do things that many observers view as irrational. Examples include addiction to cigarettes, cyclical dieting, and anorexia. His research shows that dangerous behaviors can be explained as the outcome of a reasoned and rational optimization exercise. With respect to trade policy, his research seeks to reveal the strengths and weaknesses of arguments supporting various policy options. The goal is to answer the question, what trade policies should a country implement? More generally, he applies the economic analytical method to identify the policies that can attract the most widespread support. His research focuses on international trade policy, market ethics, behavioral economics and more recently, climate change policy. His book A Moderate Compromise: Economic Policy Choice in an Era of Globalization was released by Palgrave Macmillan in fall 2010. In it he offers a critique of current methods to evaluate and choose policies and suggests a principled and moderate alternative.